Beautiful Oceanfront Suite with breathtaking views! Come and be our guest. We are anxious to share our beautiful oceanfront home away from home with you and your family. 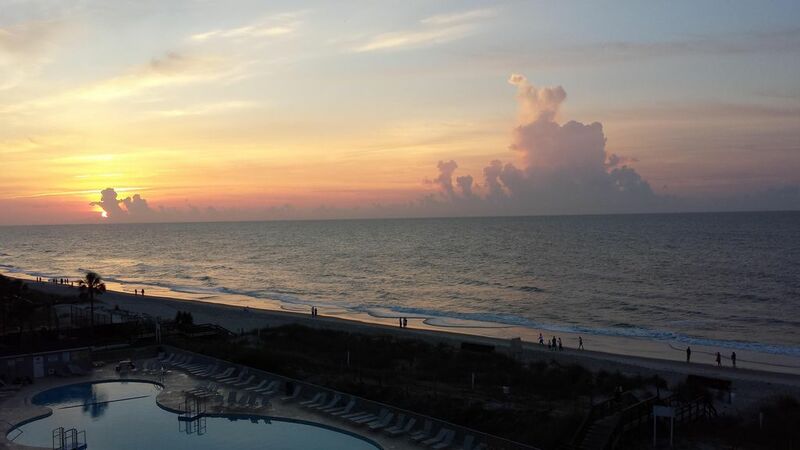 Early risers can sip their first cup of coffee watching the amazing sunrises from the privacy of our oceanfront balcony. Keep a lookout for the dolphins swimming by, or grab your towel and beach chair and enjoy a day basking in the sunshine and warm breezes on the white sand beach. Challenge yourself to an invigorating swim or an afternoon of body surfing in the abundant rolling waves. Take a break from surf and sand, and enjoy a refreshing cocktail or light lunch at the beachfront bar and grill. Enjoy a refreshing dip in any of our 6 indoor and outdoor pools, or lie back in your tube and float effortlessly down the lazy river. Once you return to the condo you will find that our remodeled kitchen is fully stocked with pots, pans, dishes, glasses, silverware and kitchen appliances and gadgets to allow for easy meal preparation. Returning guests will note the new tile flooring, remodeled bathroom, freshly painted walls, and new linens and decor in the Master Bedroom and Captains Bunk hallway. The front room boasts a sleeper sofa, etagier, and dining room table and chairs. There is a new bistro set on the balcony where you can dine al-fresco, enjoying an unobstructed ocean view or watching for the swan family that make their home among the turtles and mallards in the beachfront pond. Conveniently located in the center of it all, this location offers easy access to all of Myrtle Beach's main attractions. Whether you are looking for sun and surf, golf courses, family amusements, nightlife or some of the best fresh seafood you've ever tasted, you will find your vacation dreams realized only moments away. Our condo is in a private gated community with 24-hour security spread over 33 gorgeous acres of property. In addition to the 6 swimming pools, including 2 indoor pools, there are four Jacuzzis, three saunas, lighted tennis courts, basketball courts, volley ball courts, shuffleboard and a children's water park within the lazy river complex. There is a fully equipped playground and arcade games for children. Free WiFi is available, there are laundry facilities on each floor, and the elevator is just a few steps from our door. You can walk through our building to the indoor pool/hot tub /sauna located on the first floor. The lighted beachfront bar has live entertainment and kareoke each evening. There is an on site convenience store for necessities and breakfast and pizza. The resort is perfect for couples, families, honeymooners, seniors, reunions or business gatherings. We are only 10 minutes from the airport, and only a few miles from Broadway at the Beach, Murrells Inlet, Pawley's Island, Ripley's Believe It or Not, and Family Kingdom Amusement Park. There are more golf courses and mini golf courses nearby than you can count. Fishing charters, marsh tours, and historic tours are available. Beautiful historic Charleston is an easy day trip, only 90 miles away! Plenty of nearby shopping too from the local beach stores and flea markets to sprawling outlet malls all within a few miles. With so much to see and do, your only regret is that you didn't book another week! Plan to spend your next vacation with us, whether you have a few days or a few months to relax and unwind. The weather is friendly, and the locals are beautiful anytime of the year! Surprise! betcha thought we'd be at least 15 yrs. old right? Well we're not actually the owners yet......but our Grandma and Grandpa bought this condo for us to enjoy whenever you aren't using it! We are from the Cleveland, Ohio area, and we just LOVE Myrtle Beach! Sun, Surf, Sandcastles and Seashells! Once we get here we find our bathing suits, crocs and sunscreen then its the Beach, the Outdoor Pool the Lazy River, the Playground, the Indoor Pool, rinse and repeat. We love that we NEVER have to get dressed up or leave the resort unless its to play putt-putt, or go to Broadway at the Beach or Family Kingdom Amusement Park. Lunch time means picnics on the beach, and we have breakfast and dinner on the balcony watching for dolphins. We count turtles and swans in the pond and watch nightly fireworks shows on the beach. We love to dance outside each night to the music the D.J. plays and when we're too tired for even ONE more board game we climb into our bunk beds and go to sleep. Because we spend lots of time here we are both good swimmers, and love to body surf, build sand castles and add to our seashell collections. We might live up north, but we're Beach Boys at heart. We just LOVE coming to Myrtle Beach and know you will too! The entire condo including the oceanfront balcony was tiled in 2014 along with the bathroom walls and floor. In both living room and bedroom. We enjoyed spending Christmas here. We were able to sit on the balcony and listen to the ocean, drink coffee and enjoy the sun. The owners communicated quickly and answered our questions and offered suggestions for activities and places to eat. Keep up the good work! Thank you for your beautiful review. We're so glad that you enjoyed spending your Christmas at our condo. We love relaxing and enjoying the ocean from the balcony too. I'd love to have you and your family return the next time you're in need of a beach vacation. The happiest of New Years to you and yours! I have stayed at the Myrtle Beach Resort in the past and this condo is by far one of the best. The view from the balcony is spectacular. The condo is clean and cozy. It is perfect size for a small family. The owners, Michael and Lore are phenomenal to work with. The Myrtle Beach Resort is very close to shopping and great restaurants. There's also activities at the resort for all ages. But the absolutely best thing about the condo... (besides great location, vast entertainment, and great owners) THE VIEW!!! !Definitely take time to view the sunrise. I look forward to vacationing here again. Lovely cozy condo, Fabulous Oceanfront View! Never want to Leave! Love this Condo! Direct Oceanfront - Wow! View cannot be beat! Michael and Lore are so easy to work with! Very professional, info packet they sent was terrific, email contact and phone call very easy and pleasant, got us psyched to visit! Condo is comfortable and clean, nice beachy decor and well supplied. Super Easy access to beach, parking, elevator steps away. Beach very close, nice big pool was right there! Short walk to Lazy River and Hot Tub area by A Building. Access was important to me, was using a cane all week. Just two of us, worked out very well, would definitely recommend 503B. Love the view, big chairs on the balcony were a great treat, could hang out there forever - when not on the beach, of course! This is Husband and I third visit to Myrtle Beach Resort. Love this property - First time for this Condo Unit. Beautiful, quiet area, out of the hustle and bustle of downtown, plenty to entertain and relax without leaving the resort! Very convenient to grocery and restaurants, we never traveled more than 3 miles from the Resort the entire week! We like the Quarterdeck for the food, drinks. Had to have my Flounder basket! Karaoke was a little loud in the evening a couple of the nights, not all. Everybody down there seeming to have a great time, cannot fault vacationers cutting loose! It was entertaining! The Fireworks on the beach were really cool! So fun to sit on balcony and watch. We are repeat guests of this oceanfront condo and love it and look forward to our annual stay. Thanks Betsy and Michael, Lore and I are glad you enjoyed your stay again. From what I've heard Hurricane Florence was pretty kind to Myrtle Beach Resort so no major damage and it should be business as usual when things get cleaned up. We are a family of 5 and there was just enough space for all of us. It couldn't have been better. The kids enjoyed all the amenities of the resort and we even spent one day visiting every single pool, one right after the other. There was even a luau on Tuesday night at one of the pools with dancers performing with fire. We were able to watch it from the balcony while our baby slept. The kids also enjoyed the fireworks from the balcony at night, listening to the karaoke at the restaurant below and counting the turtles in the pond every morning. Lori and Michael were great! They answered all of our questions promptly and helped us with making our decisions on local golf courses, dolphin tours, etc. We would definitely stay here again!! 15 minutes north of Murrells Inlet for great dining and sight seeing and 15 minutes south of Old Myrtle Beach and the Boardwalk.